We bought nearly $3,800 worth of kitchen appliances this weekend. But if you know anything about us, you know we love a deal. So here’s how we managed to shave off about $1,400 from that total (we ended up paying 63% of their original cost). Yee haw! A: We prefer stainless steel over the current bisque / black mix we’ve got going on. B: The wall oven has a big burn mark up the front of it and cooks/burns things unevenly. C: Our refrigerator is slowly dying (the ice maker doesn’t work and ever since Hurricane Irene it has been cooling unevenly – icy milk anyone?). Well, actually a few signs. 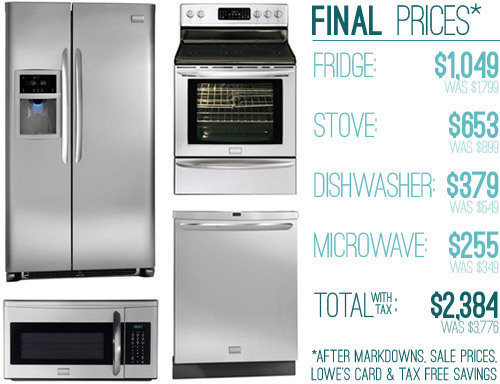 Lowe’s is our favorite spot to buy appliances since their prices tend to be the lowest we’ve found and they’ll price match. It’s actually where we bought all of the appliances for our first house which we used and loved for the entire 4.5 years that we lived there. So seeing their website loaded with discounts was enough to get our butts in gear and make some decisions. A 22.6 Cu. Ft. Energy Star Counter-Depth Side-by-Side Refrigerator: We learned that our current fridge is actually counter depth, so we definitely couldn’t get a standard depth, which would jut even further into the room. This new one is actually more spacious than our current one and the one at our last house (so we’re psyched to gain more space without giving up the counter-depth dream), but that’s a story for another day. More on that soon. An Electric Convection Stove (with Quick-Boil feature): We currently have a convection wall oven and countertop range… but those are extremely expensive to replace, so we’re going to convert our kitchen to a standard stove situation. Again, that’s a story for another day (soon!). Oh but the added convection and quick-boil features are something we happily would have paid an extra $100-200 for on top of a basic range price, but thanks to sale prices it was just $10 more than a similar model without those features. A Microwave: Nothing interesting to say about this one other than it’s very similar to the last one we had and loved. An Energy Star Dishwasher: Yay. Our first house didn’t have a dishwasher until we added one and it changed our life. And we love that it’s Energy Star like the fridge. The fridge and dishwasher were both Energy Star so that knocked those prices down another 15% (sadly cooking appliances like stoves & microwaves typically aren’t Energy Star rated). Happily the stove got the 10% off treatment thanks to the advertised sale that we happened to spot on their website. But the microwave, who was already on sale for $269, didn’t qualify (poor guy – things had to be $397 or more). We’ve had a Lowe’s card for a while (back from an appliance purchase in our last house, actually) so we scored our usual 5% off on our total purchase price. Down came those already discounted prices (we love that they allowed them to “stack”). …Virginia was having a tax-free weekend on Energy Star appliances, effectively taking another 5% off the fridge and dishwasher (since tax here is 5%)! So that’s how our grand total ended up being about 63% of what it would’ve cost originally. A total savings of $1,392. Which essentially means we got the stove and the microwave for free (their original prices add up to $1,248 before all the discounts). The best part is that many of the counter depth fridges that we looked at were more than $2,500 on their own, so we’re stunned that we got all of our appliances for less. Take that baby to the market! They still have to be delivered (for free, as always at Lowe’s) which is why this post has no pictures of the new items in place- but we’ll definitely share pics when they come. Oh and for anyone wondering, we’ll be donating our old appliances to the ReStore since they do free pick-ups (although we might craigslist the cooktop and microwave since they’re in newer condition). We’ve had a productive weekend in the kitchen, so there are a few other ideas/decisions/changes to share. So hopefully we’ll be back with lots of kitchen happenings over the next few days! We’re still only about 2% there, but the ball is officially rolling! Okay, so who else saved some moolah this weekend? Er, well, spent some moolah but not as much moolah as they might’ve originally spent? Ack, you know what I mean. Oh and to any fellow Virginians, all of the sale prices that we took advantage of should be valid through the end of today (the tax free thing along with the 15 & 10% off sales and 5% off any Lowe’s card purchase). Just throwing that out there in case it helps! Psst- Anyone replacing old appliances with Energy Star ones might also be eligible for government refunds (of over $100 if you’re replacing your dishwasher & fridge) so you can go here and click the button with the map on it to see what they’re giving back in your state. Wowza, that is amazing. I’m so happy for you guys! Oh man. Take that baby to the market! You two slay me. Still laughing. New appliances are very exciting! I bought a coffee table from Crate & Barrel this weekend… not quite on the scale of your purchase, but still expensive and exciting! Oh yeah, that’s totally exciting! I love that fridge. My mom is in love with one of those that has the freezer drawer on the bottom, but I don’t like it because it seems like just a “trunk” of food, with not much organization. This one has lots of space for a side by side and lots of movable shelves for organization. Also love the “pull out” shelf in the fridge and the wide door organizers. Oh, I said I love it..forgot to mention it’s the one I have. Congrats. Take that baby to the market! Haha. What the heck was I thinking. Thanks! Off to check it out. Your kitchen is really starting to come together! What a great deal! Doesn’t saving that much feel good? We’d love new appliances for the Little House, but have bigger fish to fry/save for (like a new DSLR– we just started a saving project towards that end). Maybe appliances will be next! yay! your kitchen makeover in the first place was so incredible – i can’t wait to see what you do here!! looking forward to the other updates you have in store! HAH! 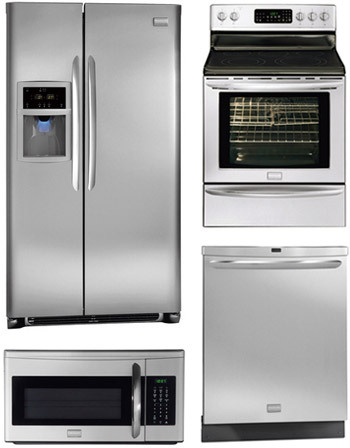 I *just* wrote a post last night about new appliances. Thanks for the tip! We used that when we moved a while back (maybe on our washer & dryer- not sure I even remember, haha). Also for anyone else that doesn’t know about it (and lives in the Midwest, though the chain is slowly but surely spreading), you can use that package of coupons at Menards since we accept Lowe’s and Home Depot coupons. Ooh good to know Krystal! Hella deals! This is the nice thing about waiting for a major purchase. As long as it’s not an emergency, you can really wait for those sale stars to align. Kudos! We had a furniture-less friend visiting from Brooklyn this weekend and hit up every yard sale and thrift store we could find. Super success! We totally have that stove and microwave–we bought them last fall the weekend before Thanksgiving when they were heavily discounted–I LOVE THEM BOTH. The stovetop is nice, and the oven is great. The quick boil isn’t really that quick for things like a whole pot of water, but the stove gets REALLY WARM. Like things boil a lot warm. I hope you love them as much as we do. OH–and my favorite thing–Mrs. Meyer’s All Purpose cleaner and a paper towel (dish cloths leave it streaky) get that glass top looking better than anything else we have tried…including the nasty chemically glass top cleaner. And you might check with your Power and Light company…my inlaws live in Indianapolis, and their power company took away their old fridge AND paid them 30 dollars for replacing it with a newer model. I had never heard of that before, but it’s worth looking into. Thanks so much for the Mrs. Meyers tip (we love that stuff!) – and so glad to hear that you have & love the same microwave and stove! Yay. As for the power company tip- amazing! Off to check about that now! Way to go! Did you notice if the discounts apply to washers and dryers? P.S. do you know how much I could sell 4 yr. old front loading washer and dryer on craigslist?? Just wondering if you knew off hand since it sounds like you troll around on there quite a bit! Glad to see the kitchen renovation is gearing up!!! Hmm, I’m not sure. I would just look for comparable things for sale and undercut it about 50-100 bucks. That way you’ll get them gone quick! We just bought our house last year and got a great black Friday deal on a LG washer and drier through Best Buy. Sears was also having a similar deal. I can’t remember specifically how much they were, but I want to say they were half of what we’d been seeing around. We also didn’t have to wait in line: they were a monster bargain, but people were more about getting the cheap deals than the ones that are “better” in terms of percentages. Is that a glass cook top? If so do you have any tips on keeping it clean? We have a brand new one on our rental and it’s impossible to keep looking good. I know we’ll upgrade to hopefully gas in our future (dream) house. Yes, it’s glass. I wish we had good tips for cleaning it. Ours looks filthy pretty much all the time. Every once in a while I go crazy and just scrub it with the rough part of the sponge and it mostly comes off. Anyone have better tips? We purchased a bottle of cleaner from Home Depot specifically for our glass cook top. It’s in a white bottle and it works great! It almost looks like lotion when you squirt it on, then just rub down with a paper towel! Gotcha. We bought one of those cleaners and special red, rough sponges but it constantly bothers me. Great deal though! you can use a paste of baking soda and a little water, with a nylon scrubby pad…. that seems to work in most cases. If I absolutely cannot get something up, I use the Mr. Clean magic eraser. I’m sure it isn’t recommended, but it does the job…. I read (I think in our manual) that the best thing to keep them looking good is to use one of those razorblade paint scrapers (like you’d use to get paint off a window) to get off encrusted food. That, plus elbow grease, baking powder and vinegar is what we use! I have the Scotch brite cooktop cleaner with pads. It works but makes a mess in the process. Then you have a ton of paper towels to clean up that cleaner mess. I do like the blue scotch bright, no scratch sponges or papertowels and Mrs. Myers. And….I just laid a pkg of tortillas on it when it was still warm. Anyone know how to get melted plastic off of it? Oh man- anyone have tips for Reenie? Maybe the razor trick? I would check with your manual to see if that’s ok with your model though just in case. We have a glass cooktop – I use the white bottle cleaner, but I apply it with a nylon scrubpad. This seems to work much, much better than just a rag or paper towel, and then once I’ve scrubbed it up good, I wipe everything up with a paper towel till it’s all shiny. The nylon doesn’t scratch the glass, and I can see my reflection when I am done! Oh, and if the cooktop is really dirty, I’ll spread the cleaner all over and let it sit for a few minutes. Works like a charm every time! 2. A special cleaning product called VitroClen (not sure if there’s an eco-friendly product equivalent to this one though). Thanks so much for all the tips everyone! So interesting! I find that Barkeepers Friend is the best for my cooktop. I have a porcelain cooktop, so check the bottle to see if it’s safe for glass. Oh yeah I used that on our old sink and loved it! Turn the stove back on….just warm enough to melt the plastic a little more, then use a dish scraper (one of the plastic ones with the “edge” that scrapes) The scraper won’t scratch the glass and it should get the melted plastic off if it’s warm enough….good luck! Hope that helps!!! For my glass cook top, I use a product called “pierre blanche”. It’s a combination of soap, glycerin and clay. It’s ecofriendly and so efficient! I’m sure this kind of product exists in US. It’s perfect for granite countertops too. Reenie, someone in our house (::cough cough:: my husband ::cough cough::) did the same thing! I did a bunch of googling and the trick was actually WD-40 (which I hate because of the fumes, but it WORKS!) and a razor blade scraper. Just keep spraying and scraping, spraying and scraping! good luck! I use the liquid Barkeepers Friend on our glass top, it works great! I’ve used a razor blade to scrape off big spills/boilovers before, too. Oh man, I melted the plastic package of tortillas on a glass top once, too. I just used the cleaner (the white bottle glass top cleaner stuff), and just kept scrubbing with a scrubbie and wiping it. It eventually came off, with A LOT of elbow grease. Bar Keepers Friend all the way! Great job guys! I can’t wait to see them all installed and looking great! when you buy multiple appliances, you can opt for an extended warranty on one or more appliances, and they will not attach them to a particular appliance. that means that if you buy three appliances, you can buy extended warranty for one or two, and that way whichever appliance needs servicing, they will apply the warranty to that appliance. we bought three appliances and two warranties and they will just get applied to whichever two have issues first. with fridge warranty protection, they will also give you a check for spoiled food if your fridge breaks. That’s awesome! Such a great tip. I was just telling the husband it’s too bad we’re not ready to tackle our kitchen because of the tax-free weekend and appliance sales. There’s always next year. We did buy a pair of solid mahogany mid-century modern nightstands this weekend off of Craigslist. We wanted something with drawers but with no shelves or anything near the bottom because of where our floor vents are. After stalking Craigslist for a few months, something finally came up. I wouldn’t say they were a steal but they were definitely cheaper than two new nightstands not even completely made out of wood. Isn’t that the best when you find something you’ve been looking for on craigslist?! Congrats! Looks like you guys hauled off with quite a steal! :D I bought fabric recently to faux-upholster my bedroom walls, and it was super-discounted to $4 a yard! Very cool. Well done! Gotta love stacked discounts! Sept/Oct tends to be a good time to buy large appliances because it’s their end of model year, so you guys timed it perfectly-without even trying! Such pros. ;-) Can’t wait to see more of the kitchen progress. I wondered if that was going on- nearly everything was marked down to begin with and then with the additional sales it was awesome! Wahoo for major savings! That’s so exciting!! We’ve been racking up the bills lately, too. We’re working on our kitchen remodel. But’ we’ve saved over 600 bucks on our stove alone: http://ourhumbleabowed.wordpress.com/2011/10/06/its-a-hot-deal/ We should get her on Wednesday! Wahoo! You must be excited to be rid of your old clunkers! Great prices too – I can’t believe you got a counter depth stainless fridge for <$1500 let alone <$1100, that's amazing. We had been watching the price on a specific range for awhile, and ordered it about a week and a half ago. Well, over the weekend, Sears put it on sale for even lower than what we paid. So we called to see what they could do, and a 10 minute phone call ended up saving us $40… not bad! That’s awesome! We always try to call to get a price adjustment if things go down right after you order them. Most stores will actually do it! About to drop $7,000 on 13 new windows to replace my 75-year-old wood windows currently in my house. I didn’t score a big deal, but I’m praying that the difference in my heating bill will pay for a good chunk of the windows in the next few years! That’s really exciting! I remember getting new windows in the last house and loving them (it was so much cleaner). SWEET! I have that same stove — ’tis great! I clean it with Bar Keepers Friend for the really tough stuff and Fantastic glass cleaner for the everyday stuff. One other thought for you money savin’ Youngsters: try shopping through Ebates.com When we bought our stove this past spring, we hunted for it at Lowes, figured out what discounts we could get (ended up being around $500 on a HUGE sale) and then ran home and bought it through Ebates. We earned a percentage back which only made things even more exciting! Just a thought!! Thanks so much for the tip Annie! We thought about Ebates but worried some of the sales wouldn’t apply or stack that way (in-store it was nice and seamless) but it’s definitely something to remember as we purchase more kitchen stuff! I want to know more about this protective coating for your appliances! I have to wipe fingerprints off on the daily thanks to my 20 month old. I found a pretty great product that only uses water (Gleen cloths), but I am still so intrigued/jealous. :) Spill. It’s just some sort of patented poly coating that they apply over the stainless steel (it’s not a “stainless steel look”, it’s actual stainless with some protective coating over it). Sure enough, Clara smacked her drooly hands all over the floor model and it was a lot cleaner than the unpolyed stainless one next to it. I’m not sure if Frigidaire is the only one to offer it or if others do too. We have this exact fridge and love it! That protective coating is FABULOUS. I have a 15 month old and nary a fingerprint even though that boy touches the thing all day long. I also have two teenage boys and nope, no fingerprints, no nothings. I wipe it down maybe once every couple of weeks! Sweet deal! Good luck on your hunt/cut-fest. Haha. We got most of our brand new kitchen appliances from Sears. 30% off all Kenmore appliances at the time. We actually got our dishwasher from Lowes though because it was a better deal. Sear’s also has a rewards program so from our appliance purchases we got $115 dollars which we put toward a new TV. Always love saving! Wow- that’s awesome too! Great tip! Our washer finally took a turn for the worse on friday. Every wash I was having to push it up on its back legs and then let it fall down so that it would start to spin (only thing that worked-lol). Repair guy said it needed a new motor. Off to Sargent’s Appliance (in MI) we went. We scored a energy saving washer that only cost $13 in energy a year. Plus it uses less water and gas! Once we turn in some rebate CE and DTE send us $25 dollar gift cards! Overall we saved $100+ and free delivery. Im hoping for a nice tax return on this baby too! Yea for scratch and dent savings!!! Counter-depth is great design-wise. I’ve learned to live with less space. Wow- love those deals! Such gorgeous finds. Our new Duet washer and dryer (which we got for $425 each, then $350 off as part of our NC Hurricane relief rebate) were scheduled to be delivered by Lowes this Saturday. I got a call that morning that my washer had been damaged beyond salvage and that I could either 1)take a free upgrade to the better Duet series washer for no additional charge or 2)wait for them to find my washer somewhere else to be delivered at a later time. I went with option 1 but then began worrying about the potential resale of this mismatched set. I called Lowes back and asked it they would upgrade both the washer and the dryer free of charge AND THEY DID! An additional $400 saved PER UNIT!! WOOO!!!! (Imagine me running around with my arms in the air) Wooo!!!! Wow!! That’s amazing! Gotta love Lowe’s! That is awesome, Stephanie! Lowe’s has the BEST customer service! I doubt Home Depot would have done that. We stopped going to Home Depot such a long time ago b/c their customer service stinks! Oh about 10 years ago, I wanted to paint my bedroom red. My parents tried to talk me into a simpler color but I had this whole scheme going on in my head and it just had to be red (they agreed with me in the end that it didn’t look great that way). But anyways, little did we know about how many coats it would take and all that jazz, so we had to keep going back to Home Depot for more paint. We took the paint lid with us from the first can and asked them to make up two more gallons. We got home and poured some into the tray and started rolling… It looked a little different but we chalked it up to be a different time of day and the wet vs dry effect. No way, the next day it was 2 different shades of red. We looked at the lid (duh) and saw that the mixture was completely different of the original one. My Dad took them in and told them what happened (this is Mr Non-Confrontation-Man), and they said “sorry”. He had receipts and everything and said “why would I buy 2 cans of red w/ different formulas?” I mean really! Anyway, they got ugly with him and so he decided to call the manager and the manager didn’t help him, so he called corporate and they told him it was up to the manager of the store to offer a refund/replacement. The manager said if we had noticed after leaving and turned right around that would be a different story! Ain’t that a crock? Anyhoo, we don’t go there anymore. LOL! My Dad loves Lowes so much that he cannot wait to retire and go get a part time job there. How funny is that? That’s so funny! Your dad must really love Lowe’s! We love our appliance guy there (Jimmy). I told him I wanted to be best friends. Of course he just laughed at me. But he’s the best. we love jimmy! but does he ever take a day off? every time we’re in there he’s there. he went to high school with my husband so we usually go back to say hi, and every.time he’s at the desk. Are you going to do the installation/hook up on the dishwasher? We bought a dishwasher a couple months back and had Sears have a plumber come in to hook it up – we were too scared to mess with the plumbing. I’d love to see how to do it, though, if you guys are planning on DIYing it! We are planning to tackle that ourselves- for the first time. Let’s hope we can figure it out! Haha. Congrats!!!!! We had our own awesome weekend where we did most of our Christmas/birthday shopping for all the kiddies in our life. You can get fantastic coupons over at Hasbro Play Saver. My husband did the dance of joy (or his equivalent since he is not too coordinated) because he got Thor’s Hammer for super cheap. Actually, now I am wondering if he bought that for himself…. All in all, we saved over 300 bucks this weekend. Yeah! Wow- that’s awesome! Love all the deals everyone’s sharing. 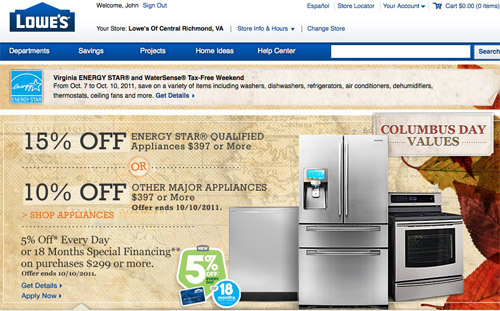 We just bought all new appliances from Lowe’s in April. Love all the discounts. We opted for Samsung in Stainless steel. Check with your energy company, they might also give you rebates. Sweet deal! I’m so jealous about the stainless steel, I desperately need some in my life. For the glass top try a pumice stone. You can get them near the nail polish etc etc. It’s technically glass so it won’t scratch the top and you can use it on all ceramic surfaces too. Hard water in your toilet? Pumice stone and elbow grease! Best of all? It’s CHEAP, maybe $3 for a stone that will last a year. Never heard of that! Thanks for sharing. We had a similar experience a couple weeks ago. We’re replacing our front door/frame and storm door as well as our garage entry door/frame (they were just using another interior door that wasn’t even flush to the floor!). Starting price for all three (we’re getting steel doors for increased security/energy efficiency) was around $9k and we talked it down to $5.5k (still cringe-worthy but not a bad deal at all for what we’re getting!). when we bought appliances for out lake cabin, we went w/ wolf & sub zero, the same brands (although not the same models) that we have at all our other houses. we had to pay extra to have them delivered from over 200 miles away, but it was worth it to go w/ a brand that we know & trust. i love the wolf dual fuel (gas stopve top, electric oven)dual ovens & sub zero is the best there is (in our opinion) for refrigerators & wine storage units. The pic of the red barn over the bridge looks EXACTLY like the one on Beetlejuice where they get into the wreck!! Not sure how I even remember/know that but its all I could think of when I saw it!! So exciting! Congrats!!! Amazing tips – I am saving this post for when I am ready to buy appliances! You’ve inspired me to go refrigerator shopping today. I didn’t know about the VA Tax Free holiday-ness going on! I’ll have to see if we can hunt down a great deal. We just used mild cleaner (like Dr Bronners or Mrs Meyers) and a microfiber cloth to sort of buff it. Sometimes no soap and just a dash of water on the cloth. Try WD-40. I know it sounds odd, but I tried everything, and that worked best for me. Just spray it onto a cloth, then polish it. It really helps reduce fingerprints. Stainless Steel Magic is the best! I’ve tried everything and this stuff works! i bought that exact set from lowes earlier this year. except we got the french door fridge and the slide in stove with the flat top. i think we paid about 4500 total. i found out after reading the owners manuals that those are made by ELECTROLUX! SCORE!!!. also i got the glass top cleaner kit and it has a razor blade scraper on it that works great. its just always fingerprinty/smudgy no matter what.. i end up buffing it up with a dishtowel at least once at day. No way!!! Love it! Electrolux is so fancy. Thanks for the cleaning tip. This is one of those moments when you realize just how expensive being a grown up is. You guys did great, but still… ouch. That is some amazing luck you guys had! All that planning and saving paid off (no pun intended!). I planned out most of what I needed/wanted, and went shopping. I picked up the couple of things I could get at Kikki.k, which came to about $75 (yep, those schmancy products come with equally schmancy pricetags!). But, when I got to the counter, the lady signed me up for their loyalty program, which gave me 25% instantly! So I still have a bit over $10 to spend. Then I popped into Kmart for some less schmancy supplies, and found the cards I want for my wedding thank yous in six packs for $1 a pop! They had seven packs, which should be plenty considering most of our guests travel in pairs ;-). If I could have some of that shopping juju when we eventually redo our kitchen, that would be great! Haha, I love it! Sounds like such a fun day of shopping. PS: We just started our little blog. Kitchen pictures and layout will be up soon. Wahoo! Happy blogging! And congrats on the cabinet savings! Those suckers can be expensive! PS.. be VERY careful about magnets on the fridge… the fingerprintless coating is very easy to scratch.. we found out the hard way with a magnet that had a metal holder. luckly the door had been delivered with a scratch in it already so we got a new door. but beware! Thanks so much for a tip! We usually don’t do the magnet thing (I make a pinboard in a cabinet door and we tack stuff up in there). We have a stainless steel fridge, but magnets don’t work on it…just on the vinyl sides. Does the poly coating allow magnets to stick?? Oddly enough we asked that and it does allow magnets to stick!